SACRAMENTO, Calif. — Buddy Hield scored 21 points and Zach Randolph scored all 18 of his points in the second half, as the Sacramento Kings rallied to defeat the Oklahoma City Thunder 94-86 on Tuesday night. Hield, who shot 7 of 9 from the floor and made all four of his 3-point attempts, also pulled down seven rebounds and had two steals in 28 minutes off the bench. 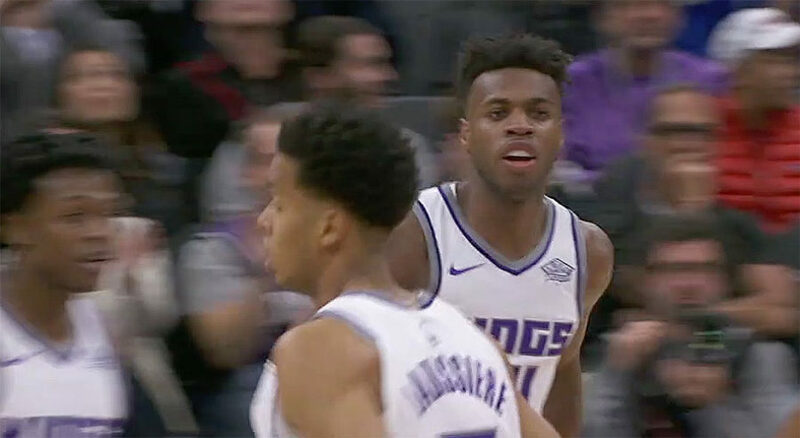 Randolph went 8 of 15 from the field and grabbed eight boards, while rookies Justin Jackson and De’AaronFox finished with 16 and 10 points, respectively off the bench for the Kings, who overcame a dismal start to snap their six-game losing streak. Russell Westbrook paced Oklahoma City with 20 points, 12 rebounds, six assists and three steals, but shot 7 of 21 and turned the ball over seven times. Carmelo Anthony needed 17 shots to score 16 points, while he also grabbed seven rebounds. Fellow newcomer Paul George needed 16 shots for his 12 points and he also had six rebounds and three steals for the Thunder (4-6), who were suffering their third straight loss. Steven Adams finished with 14 points, six rebounds and a team-high five steals, while Jerami Grant ended with 10 points and six boards off the bench for Oklahoma City in the defeat. The Thunder scored the first 10 points of the game and went on to build a 25-8 advantage late in the first quarter. However, Westbrook and Co. were not able to hold on as Sacramento (2-8) rallied to win at home for the first time in four attempts this season. After shooting just 16-percent in the first quarter, the Kings shot 70.6-percent (12 of 17) in the second quarter to outscore Oklahoma City 32-16 and went into the interval with a 42-41 lead. Sacramento led 67-57 at the start of the fourth quarter before the Thunder cut the gap to 77-76 with 4:30 left to play. But the home side scored six straight points to build the lead back to seven points and hold out down the stretch. Overall, Oklahoma City shot 33.7 percent on 29 of 86 shooting. Sacramento went 46.8-percent (37 of 79) from the field.